Azerbaijan’s Foreign Minister Elmar Mammadyarov met Minister of Foreign Affairs and Trade of Hungary Péter Szijjártó on 27 September in New York on the sidelines of the 73rd session of the UN General Assembly, the Foreign Ministry reports. The ministers discussed bilateral cooperation issues, including the economic and trade relations and exchanged their views on regional energy and infrastructure projects. 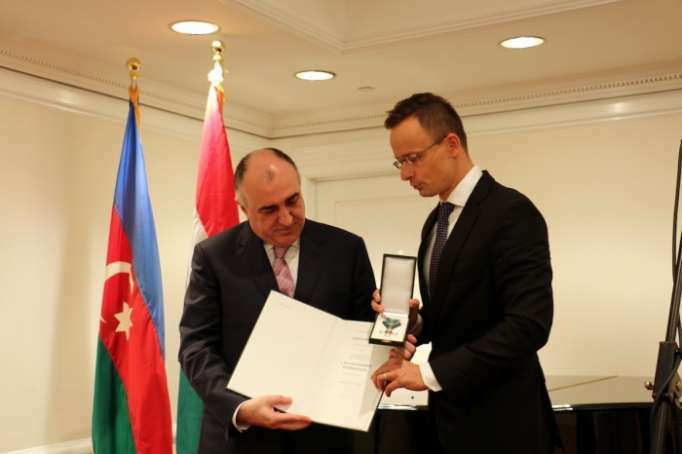 In recognition of his contribution to the development of relations between Azerbaijan and Hungary, Mammadyarov was awarded the Commander’s Cross of the Order of Merit of the Republic of Hungary. Presenting the award to his Azerbaijani counterpart, Szijjártó extended his gratitude to Mammadyarov for his valuable contribution to the development of bilateral relationship and conveyed his belief in further development of bilateral ties, especially in economic and energy spheres. Minister Mammadyarov expressing his appreciation to Hungarian Minister valued the award as an encouragement for further strengthening of mutually beneficial cooperation between Azerbaijan and Hungary.